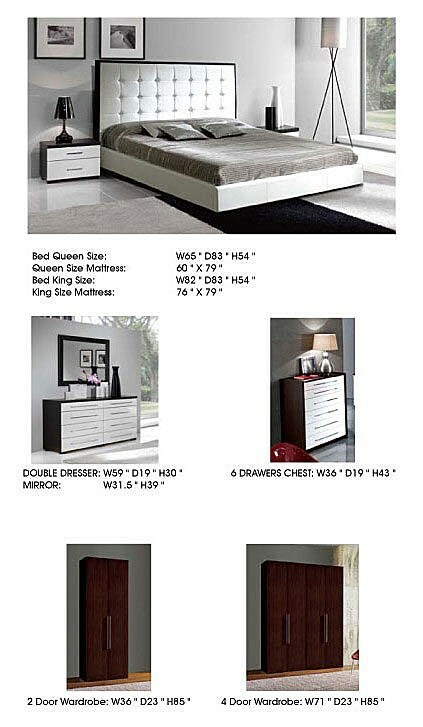 Platform King Bed: L82" x D83" x H54"
Platform Queen Bed: L65" x D83" x H54"
Nightstand: L20" x D15" x H15"
Dresser: L59" x D19" x H30"
Mirror: L39" x D1" x H31.5"
2 Door Wardrobe: W36" x D23" x H85"
4 Door Wardrobe: W71" x D23" x H85"
We decided to come up with something new and combined Penelope bed with a perfectly matching Luxury bedroom set's nightstands, dresser and mirror. You get a modern leather upholstered Penelope storage queen or king bed, two tone white and dark brown wood dresser and nightstands. Optional six drawer chest and two or three door wardrobe. Penelope Luxury bedroom set is a collection from Spain and Italy.